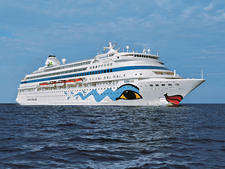 AIDAaura entered service in 2003 as the third ship to join the AIDA fleet. 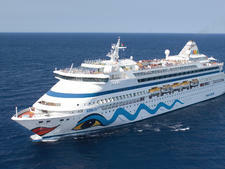 Like the identical, 2002-built AIDAvita, it is an enlarged and improved version of the original Aida (now AIDAcara). 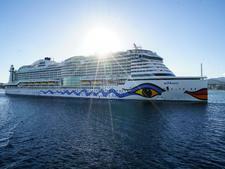 As with all all AIDA ships, it was specially designed around the line's ultra-casual "club ship" concept. Like AIDAcara and AIDAvita, the two main restaurants onboard, the Calypso Restaurant and Markt Restaurant, offer open-seating, buffet meals. The extra-tariff a la carte Rossini features waiter service and near-gourmet quality food. The Das Theater theatre is the largest public room on the ship, while other bars and lounges include the trademark AIDA Bar -- one of the largest bars at sea -- the surprisingly elegant Hemingway Bar and the Anytime Disco. 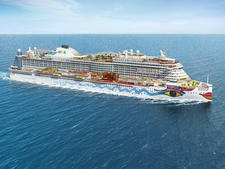 The Body & Soul spa and Fit & Fun fitness center are some of the largest of their kind at sea, and the pool deck is designed to resemble a beach, complete with palm trees, a freeform pool, artificial "rock formations" and a volleyball/basketball court. Indoors you'll find the unique AIDA Golf putting green and golf simulator. Cabins onboard are mostly standard insides and outsides; while of average size, the bright and cheerful furnishings make them more attractive than most mass-market cabins. There are only a few balcony cabins and suites; most passengers on this ship will be more interested in having fun in the public rooms than spending time hiding away in their private quarters. Built in Finland in 1996 as "Aida," AIDAcara was the very first ship in the fleet of what is now Germany's largest cruise line.